The long-billed plover (Charadrius placidus) belongs to the family of lapwings and plovers, the Charadriidae. The long-billed plover is distributed in India, Nepal, Bhutan, Myanmar, Thailand, Laos, Vietnam, Malaysia, China, Mongolia, North Korea, South Korea, Russia and Japan. These plover species are mostly migratory. These plovers are monotypic species. The long-billed plover (Charadrius placidus) is a medium-sized plover, measuring 17 to 22 cm in length and weighing 40 to 70 grams. The wingspan is 45 cm. The long-billed plover has grayish brown crown, back and wings. The forehead, chin and throat are white. There is a white neck band with a black band below it. Below the black band, there is a grayish brown half-band. There is a black patch behind the forehead. There is a white supercilium. There is a grayish lore extending below eyes to cover the ear coverts. The underparts are white. Juveniles have brown upperparts. The bill is comparatively longer than the common ringed plover. The bill has characteristic dark chocolate color. The irises are blackish. The legs and feet are pinkish yellow. The call of these plover species is a shrill and metallic, "chee..chee" or "cheep..cheep" sound. These long-billed plover species are distributed in India, Nepal, Bhutan, Myanmar, Thailand, Laos, Vietnam, Malaysia, China, Mongolia, North Korea, South Korea, Russia and Japan. In India, these long-billed plovers are distributed in the states of Uttar Pradesh, Bihar, West Bengal, Assam, Arunachal Pradesh, Nagaland and Manipur. Vagrant plovers have been observed in Sri Lanka, Bangladesh, Brunei, Indonesia, Hong Kong and Taiwan. The Important Bird and Biodiversity Areas (IBA) of these long-billed plover species in North Korea are Chongdan field and Ongjin Bay. The IBA of these species in Japan is Hachirogata. 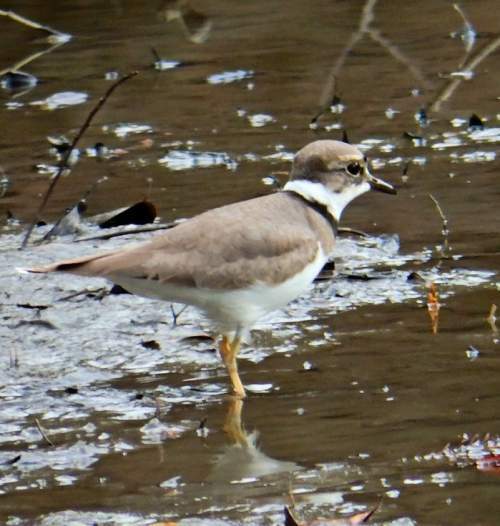 These long-billed plover species do not normally occur in forests. They normally occur in altitudes from 0 to 2000 meters. The artificial ecosystems and habitats of these species include flooded cultivated lands and flooded pastures. The natural ecosystems and habitats of these species include, freshwater lakes, rivers, streams, creeks, islands in the rivers and marine intertidal mudflats. The diet of this long-billed plover consists mainly of insects. Small insects, flies, beetles and worms are their primary food. The breeding season of these long-billed plovers is from March in their northern breeding range. Their breeding range is restricted to Japan, Russian Far East, China (north of Yangtze River and east of Sichuan) and northeast India (western Arunachal Pradesh). The long-billed plovers nesting sites include beaches, lake-shores and stony river beds. They nest in depressions in sandy, shingle grounds among pebbles and rocks. The typical clutch contains four eggs (Wiersma 1996, Wilkinson et al. 2008). These long-billed plover species are mostly migrant birds. The migratory breeding populations are distributed in northern Japan, Russian Far East, North Korea and China (north of Yangtze River and east of Sichuan). They migrate southwards for wintering. Wintering long-billed plovers are distributed in northeast India, Nepal, Bhutan, northern Myanmar, northern Thailand, northern Laos, northern Vietnam, south and southeastern China and South Korea. They return to the breeding grounds in early summer. Non-migrant breeding resident populations occur in northeast India (western Arunachal Pradesh) and southern Japan. The global population size of the long-billed plover (Charadrius placidus) is estimated to number about 670 to 17,000 mature individual birds. The overall population trend of the species is considered to be decreasing. In most of its range, this species is reported to be uncommon to rare. The generation length is 5.2 years. Its distribution size is about 7,000,000 sq.km. Habitat alteration and destruction and hunting are the main threats that are endangering the survival of these plover species. The long-billed plover (Charadrius placidus) does not approach the thresholds for being Vulnerable, either under the range size criterion, or under the population trend criterion or under the population size criterion. The CITES (Convention on International Trade in Endangered Species of Wild Fauna and Flora) status is ‘Not Evaluated’ for the long-billed plover (Charadrius placidus). The long-billed plover (Charadrius placidus) is closely related to common ringed plover (Charadrius hiaticula). 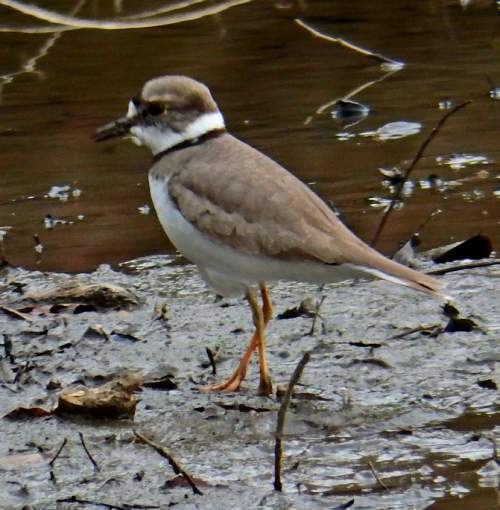 Current topic in Birds of India: Long-billed plover - Charadrius placidus.